Australia’s brand as a top study abroad destination continues to strengthen – and in a growing number of sending markets. The Australian government has just released data showing that international student numbers grew by 11.4% in 2018, another year of double-digit growth following a 12.6% increase in 2017. There are now 693,750 international students in the country – 70,820 more than in 2017. Total international enrolments also grew substantially to reach 876,400. The discrepancy between total enrolments and student numbers occurs due to the fact that the same student can enrol in more than one course during a year. Enrolments grew by 10.1% following 12.2% growth in 2017, while commencements increased by 6.6% after 10.2% growth in 2017. Higher education posted the largest gains in 2018 (14.4%) after a strong 2017 as well, and with a significant increase in post-graduate enrolments. For the first time, as of 2018, the number of international enrolments in post-graduate programmes in Australia is now greater than the number for undergraduate studies. The vocational sector (VET) also experienced a surge in international enrolments (13%) following growth of 15.9% in 2017. The English-language training sector grew modestly by 0.7% following 3.3% growth in 2017. Non-award programmes were the only sector that declined slightly (-0.2%, in contrast to a 13.5% increase in 2017). As the table reflects, Brazil accounted for the fourth highest number of enrolments (40,864 – 12.3% more than in 2017). Malaysia rounds out the top five sending markets with 33,730 students, and modest growth of 3.2% over the year before. In total, students from the top five sending markets make up 56% of all international students in Australia. 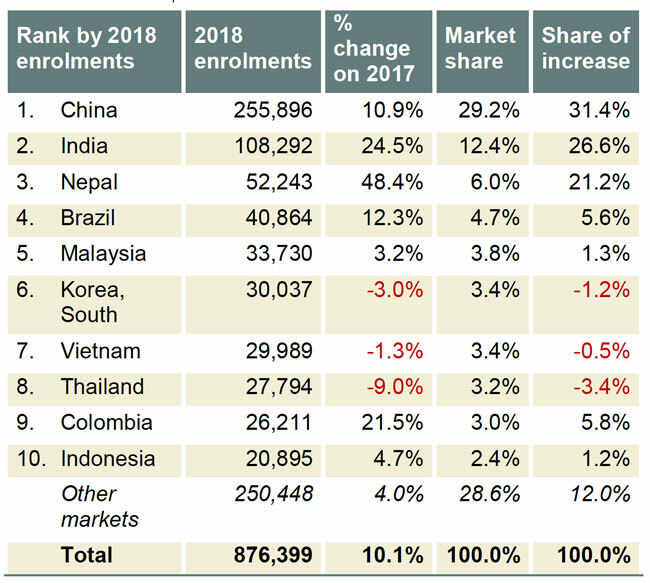 There were notable declines as well: enrolments from South Korea, Vietnam, and Thailand, which are the sixth, seventh, and eighth largest foreign student markets for Australia, declined by -3%, -1.3%, and -9%, respectively. Colombia (26,210) and Indonesia (20,895) complete the top ten sending markets for Australia, and Colombia’s growth was especially notable: enrolments were up by 21.5% over 2017. The dynamism in the top ten markets is replicated in emerging markets for Australia as well, sometimes even more dramatically. Looking just at 2018 commencements, Mongolia grew by 41% year-over-year, Bhutan by 38%, and Philippines by 36%. Notable increases also came from Chile (27%), Argentina (25%), Myanmar (18%), Sri Lanka (18%), Kenya (15.2%), and Bangladesh (10.3%). Austrade also highlights several market characteristics in the Philippines that are contributing to the country’s rapidly expanding contribution of students to Australian institutions, including a growing middle class, economic expansion, and high unemployment. The number of agents operating on behalf of Australian institutions is now significant, and the report states that Australia and the US are tied for first place as the preferred destination for Filipino undergraduate students. International education represents Australia’s third largest export (after only coal and iron ore) and was valued at AUS$34.9 billion in 2018 (US$24.7 billion). But Australian education is widely delivered outside its borders as well: 119,450 students were enrolled in an offshore Australian higher education programme in 2017, an increase of 6% over 2016, and 36,765 students were enrolled in an offshore VET programme the same year, according to the Department of Education and Training. This entry was posted in Australia, Australia/Oceania, Regions and tagged Australia’s foreign enrolment, .